Describe Los Angeles in one word: Construction. I cannot help but to look at the construction of the Wilshire Grand Center in downtown in awe. It will soon be the tallest skyscraper on the West Coast, and I can see it being built right before my eyes! Something about the way a building is constructed has always amazed me and every time I drive by this marvelous piece of engineering I get eager for it to finish being built. I think about how back in the day LA’s tallest building was City Hall, a mere 454 feet. 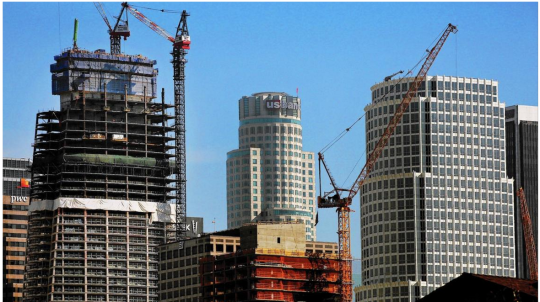 Now, the Wilshire Grand Center will stand at 1,100 feet! Currently, the tallest skyscraper in Los Angeles is the building right next to it, the U.S. Bank skyscraper. However, it will be overshadowed very quickly. Technology just keeps getting stronger and smarter and we are able to reach new heights (pun intended) with it. Since my start at USC I have taken 2 Civil Engineering classes and even at the beginner level courses, I am learning about a building’s construction. Through my exposure of AutoCAD and Revit I got an idea of how detailed and time-consuming this process is. Through my visit of the Walter P. Moore office I got a sense of how the facade of a building is constructed. The Wilshire Grand Center, although not complete yet, will have a grandiose curving facade at the entrance. I cannot wait to see the final product. I cannot wait to be a part of a similar project in the future.